God made all the animals including the elephant. The elephant is the largest known land animal living today. Male elephants can grow to 14 feet tall and can weigh more than 12,000 pounds (6 tons). Not all elephants are this large. The African pygmy elephant only grows to about 7 feet tall. People sometimes confuse the African Elephant, pictured above, and the Asian Elephant pictured to the right. One quick way to tell the difference is to look at the ears. The African elephant has larger ears than the Asian elephant. Another noticeable difference is that the Asian elephant has a longer head with a “dome” on top. Elephant babies have unusually long gestation periods. They remain in their mother's womb for about 20 months--almost two whole years! Compare that to human babies who live in mother's womb for 9 months. 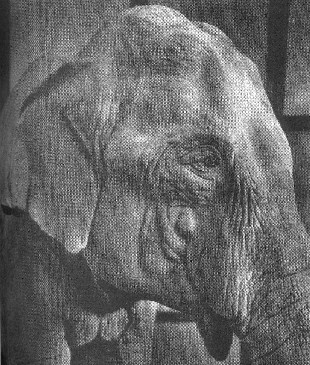 Elephants have been known to live in captivity for up to 70 years. It is speculated that they can live even longer in the wild. The life span of many wild elephants is cut short by poachers. Poachers are people who kill elephants so that they can take their tusks and sell them. Sometimes poachers use very cruel methods to kill elephants. It is illegal to kill an elephant to take its tusks, which are also called ivory. The Bible says that “the righteous man regardeth the life of his beast, but the tender mercies of the wicked are cruel.” We are supposed to be good to animals and not mistreat them. The elephant is an herbivore. That means that they only eat plants. Elephants are big eaters consuming 300-500 pounds of grass, leaves, roots, bark branches, fruits, bean plants, millet and banana tree, shrubs, etc. in a single day. In order to find this much food, the elephant must forage up to 20 hours a day looking for food. They sometimes uproot entire trees to get at more food. 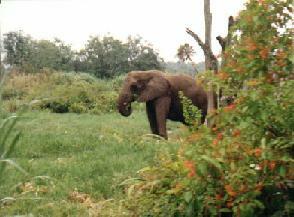 This can devastate the small landscapes that some elephants have been confined to. Because of the tough foods they eat, elephants can go through six sets of teeth in their lifetimes--each tooth weighing 9 pounds! In a zoo, an elephant may primarily eat hay along with treats like apples, carrots, lettuce and honeydue melon. To some, the elephant’s digestive system does not seem to be very efficient, yet we know that our loving God gives every creature what it needs to survive. Sometimes mother elephants encourage their babies to eat their (the mother’s) dung. It is believed that in her dung are certain bacteria that will take up residence in the baby’s stomach to help in digestion. The bacteria help break down the harsh foods that the elephants eat. A human should NEVER eat feces because it could be harmful or even deadly to us! If available, the elephant can drink 50 or more gallons of water a day. They have good memories and are able to find their way to waterholes remembered through successive generations. Healthy adult elephants don’t really have any predators; however, unprotected baby elephants are at risk of attack by animals like lions and hyenas. 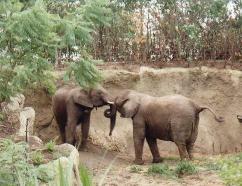 Elephants live in herds and are very protective of one another, forming close familial bonds. The elephant is another fascinating animal that God made. God loves all of His creatures and takes great care of them by providing them with food, water, shelter, survival skills, and the companionship of other animals. Blessed be the name of the Lord.